This impressively beautiful jay can be found only in North western Mexico from Sonora to Jalisco. The Bay of Banderas, where this species is a year round resident, represents a part of the southernmost corner of its small distribution range. Although carrying the common colors of Mexican jays – black, blue and white, this species clearly stands out among its kin thanks to its enormous size (up to 80 cm, 30 in) enhanced by the presence of a very long tail. The first part of its common name (Black-throated) refers to the color of its head, chest and crest. Its nape and upperparts are metallic blue and underparts are white. 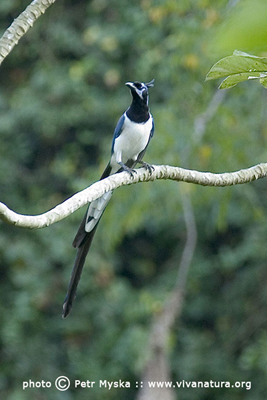 The Black-throated Magpie Jay, just as other members of family Corvidae, which embraces all jays, crows and ravens, consumes a vide variety of food items, including insects, fruit, seeds, nestling birds, small reptiles and amphibians. It is usually seen traveling through the canopy either in pairs or in small family groups. Just as many other species of tropical Corvidae, this species is a cooperative breeder. Several individuals will build and attend a single nest. In the Bay od Banderas area, this species is tied the tropical forest habitat. Although distributed throughout, it is most frequently spotted in the Punta Mita area.